Decima Moore was a successful actress, who combined her career with family life. She had a son but was divorced from her husband in 1901. Divorce was still a costly legal process in 1901 and one that encountered much disapproval: judicial separation (although it did not leave the parties free to remarry during the other's lifetime) was more common. Single parent families however were much rarer then than now. Lilian Decima Moore was born in Brighton where her father was the county analytical chemist for Sussex. She had four sisters, all of whom were on the concert platform or the stage as singers. Her preferred roles were in musical comedy and light drama. 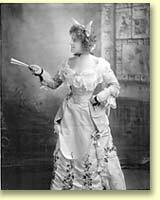 Moore made her debut in London, aged 17, at the Savoy Theatre on 7 December 1889, playing 'Casilda' in the Gilbert and Sullivan opera The Gondoliers. It was a hit and more work followed. Two of her roles mentioned by George Bernard Shaw in his book, Our Theatres in the Nineties, were in The White Silk Dress and Lost, Stolen and Strayed. In 1901 Moore was playing in both A Diplomatic Theft at the Garrick Theatre, London and The Swineherd and the Princess at the Royalty. In 1894 in Richmond, New York, whilst touring in the show The Gaiety Girl, Moore married a fellow cast member, Cecil Ainslie Walker-Leigh. Later, in 1896, to please her mother, she had a church wedding in London. 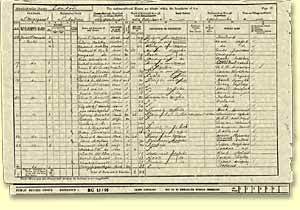 A son was born in 1898, but Moore subsequently divorced her husband for adultery and cruelty, the divorce being finalised in 1902. She later married Brigadier General Sir F. Gordon Guggisberg, governor of the Gold Coast (now Ghana). Moore continued to act in the theatre until 1914, after which she was engaged on war work in France, for which she was awarded a CBE in 1918. She later held various official positions including, in the 1920s, that of Honorary Exhibition Commissioner for the Gold Coast at the British Empire Exhibition. She was also a member of the Actress' Freedom League and the International Woman's Franchise Club. In 1931 Moore appeared in the film Nine till Six. the number in 1901 was higher than any previous year', a rise of nearly 10% on 1897 figures. The number of judicial separations - cheaper than divorces - rose in 1901 to 7,330, an increase of nearly 32% since 1897. Nevertheless, numbers divorcing were much lower in 1901 than later in the century, and households headed by divorced women were almost unknown (although there were more widows). 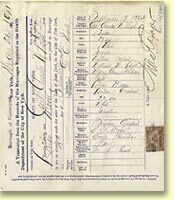 Between 1901 and 1905, an average of 812 petitions for divorce were filed. Of these, slightly more than half (53%) were submitted by husbands. Eighty years later, between 1981 and 1985, the average number of petitions had jumped to 176, 969 per year. Nearly three-quarters (73%) were submitted by wives - striking evidence of female emancipation. Follow this link for more on tracing divorce records.